For many people who believe in superstition, the number 13 is considered to be an unlucky number, riddled with misfortune. At Alan R Jones & Sons, we have reason to believe that we have lucked out with the number 13, or 13,000 to be precise, and here’s why. We have recently acquired an additional 13,000 sq. ft of warehousing space, less than half a mile from our headquarters. The warehouse, which now takes our storage and warehousing facilities up to over 35,000 sq. ft of capacity, is fully racked and has already seen its first intake of customers. Providing our customers with options for racked storage, order picking, stock control and container loading/unloading, our array of services is proving to be increasingly popular amongst our clientele. 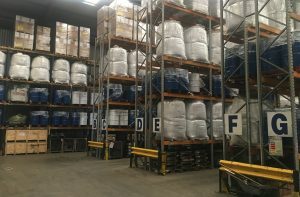 Our ability to offer warehousing services on an individual basis, or as part of a wider, more comprehensive strategy has encouraged our need to expand our service offering and extend into a new facility. As a family run business, that values tradition and providing the best possible service for our customers, it is imperative that we can offer these services when necessary, as well as ensuring we provide our customers with a complete overview of all operations. By expanding the business as required but remaining within our hometown of Newport and on the same site as our headquarters, this has had commercial and operational benefits for both us and our customers.